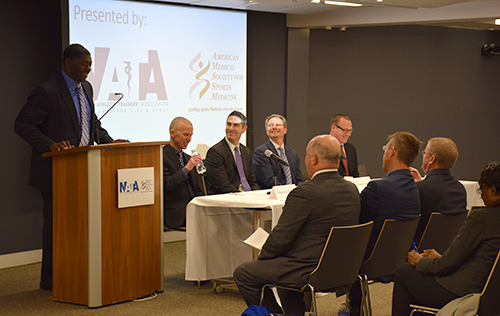 NATA and the American Medical Society for Sports Medicine recently hosted “Collaborative Solutions for Safety in Sport,” a meeting designed to bring key stakeholders together to discuss sports safety in secondary schools across the country. After the publication of the “Preventing Sudden Death in Secondary School Athletics: Best Practices Recommendations” consensus statement in 2013, the inter-association task force that worked on the statement was having a planning meeting when the same question kept coming up: Now that we’ve made these recommendations, how are we going to implement them? It was suggested to bring key stakeholders – in this case, the leaders of state athletic associations who handle secondary school sports – to under one roof to discuss how to implement these best practices. Just like that, the idea to host Collaborative Solutions for Safety in Sport was born. A planning team led by Doug Casa, PhD, ATC, FNATA, FACSM, worked together to organize the event. NATA and AMSSM agreed to fund the travel expenses for the attendees, and the National Football League agreed to host the event at its headquarters building on Park Avenue in New York. The planning team put together an elite list of speakers for the meeting to cover the main points of emphasis: heat illness (Casa), cardiac conditions (Jonathan Drezner, MD), exertional sickling and emergency action plans (Ron Courson, ATC, PT, NREMT-I), CSCS, and head/neck injuries (Kevin Guskiewicz, PhD, ATC, FACSM, FNATA). 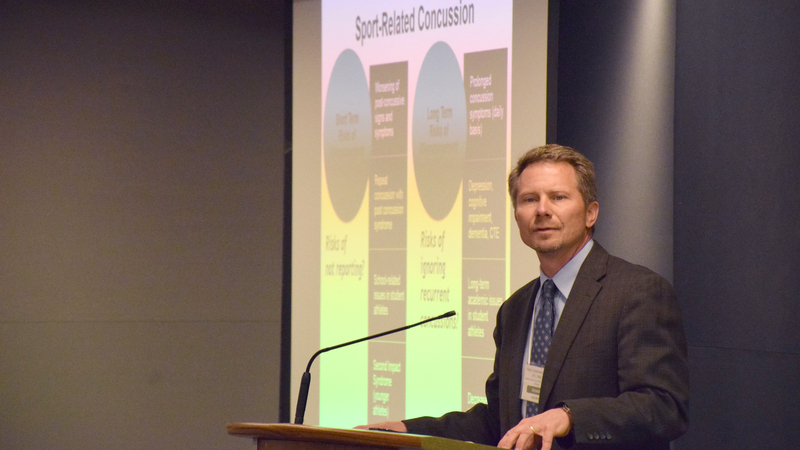 Kevin Guskiewicz speaks about best practices for head and neck injuries. Additional speakers included former professional football player and co-founder of MISSION Athletecare Chris Valetta; NCAA Chief Medical Officer Brian Hainline, MD; NATA President Jim Thornton, MA, ATC, CES; AMSSM President Chris Madden, MD; former NFL football player and current Director of Youth and High School Football Safety for the NFL Roman Oben; Mike Carroll, ATC; Ralph Swearngin, PhD; Mike Ferrara, PhD, ATC; Katherine Dec, MD, FAAPMR, CAQ; Charles Breithaput, PhD; Cindy Chang, MD; Bill Shinavier, ATC; Jason Cates, ATC; Marilyn Que Tucker; Harris Patel, PA-C, ATC; Jack Dubois; John Kripsak, DO; Josh Bloom, MD, MPH; Verle Valentine, MD, John Miller and Gary Del Vecchio. 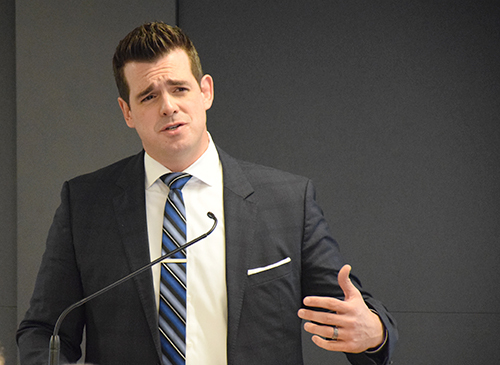 Former professional football player and co-founder of MISSION Athletecare Chris Valletta delivered the keynote during the first day of the CSSS 2015 event in New York. 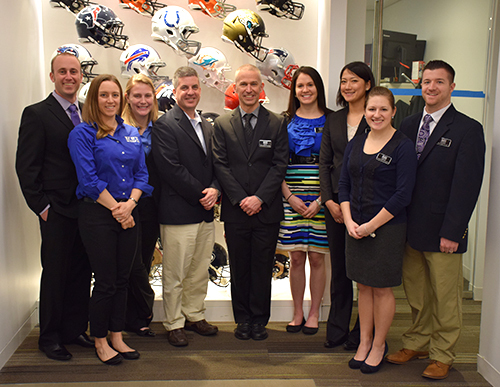 The executive director and Sports Medicine Advisory Committee (SMAC) chair from each state’s high school athletic association were invited, and nearly 150 were in attendance for the meeting in New York March 26-27. Each state had at least one representative on hand to hear from the expert speakers about how to make sure they are providing the safest possible environment for their athletes. Additional speakers from various state athletic associations discussed the policies they’ve already implemented and whether those have been successful, walking through the challenges and lessons learned. Each section was followed by a lively Q&A discussion during which attendees were able to pose questions and ask advice from their peers. Look for a full recap of the event in the May NATA News. Former professional football player and NFL Director of Youth and High School Football Safety Roman Oben addresses the audience during the press conference. Doug Casa, PhD, ATC, FACSM, FNATA, discusses heat illness precautions during the press conference. Journal of Athletic Training Editorial: "Moving Forward Faster: The Quest to Apply Evidence-Based Emergency Practice Guidelines in High School Sports"